Heat barbecue for indirect grilling: Light one side of barbecue, leaving other side unlit. Close lid; heat barbecue to medium. Cut zucchini lengthwise into 1/2-inch-thick slices; place in large bowl. Mix dressing and garlic. Add to zucchini; mix lightly. Place zucchini on grate over lit area. Grill 10 to 12 min. or until tender, turning occasionally. Meanwhile, mix egg, ricotta, 1 cup shredded cheese and 2 Tbsp. Parmesan until blended. Spread 1/2 cup pasta sauce onto bottom of 8-inch square foil pan sprayed with cooking spray. Cover with layers of 1/3 of the zucchini, half the ricotta mixture and 1/2 cup sauce. Repeat layers. Top with remaining zucchini, sauce, shredded cheese and Parmesan; cover with foil. Cut small slit in foil to allow steam to escape. 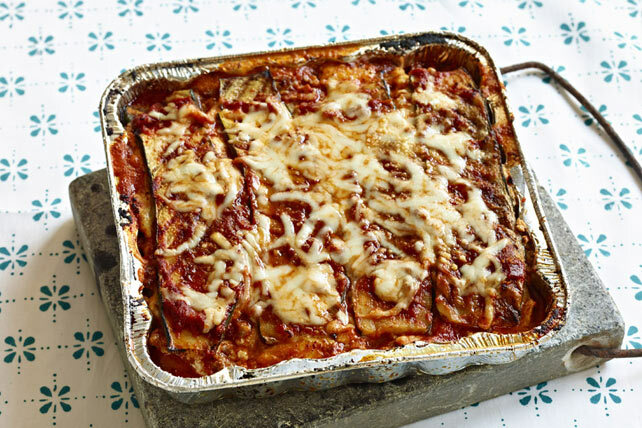 Place lasagna on barbecue grate over unlit area. Grill 30 min. or until heated through, monitoring for consistent grill temperature. Remove from barbecue; carefully uncover. Let stand 5 min. before serving. Cut thin slice from one long side of each zucchini. Place, cut side down, on cutting board, then cut lengthwise into 1/2-inch-thick slices. Light one side of barbecue, leaving other side unlit. Close lid; heat to desired temperature. Place food on grate over unlit area; cover. Grill as directed, monitoring for consistent temperature. Use this method for foods that might dry out or burn if cooked until done over direct flames, such as whole chickens, delicate fish fillets or pork shoulders.